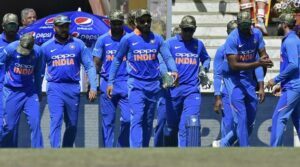 India Cricket World Cup 2019 Team, Squad, Captain, Players List: India’s 15-man squad for the upcoming ICC Cricket World Cup in England and Wales was announced at the BCCI headquarters in Mumbai on Monday (April 15). Ambati Rayudu and Rishabh Pant have not been included in the squad while Dinesh Karthik, KL Rahul and Ravindra Jadeja have found places. The team will be captained by Virat Kohli while Rohit Sharma will be his deputy. MS Dhoni is the first-choice wicketkeeper. Khaleel Ahmed, Deepak Chahar, Navdeep Saini and Avesh Khan have been selected as the net bowlers helping the Indian cricket team during the World Cup. The four bowlers will travel to the UK with the rest of the team. Chairman of selectors MSK Prasad said that Karthik will be the back-up wicketkeeper and was preferred over Pant due to his superior skill behind the stumps. Karthik, the oldest Indian player in terms of international debut (three months before Dhoni in September 2004), was also part of the Indian squad during its disastrous 2007 World Cup campaign but missed out on 2011 and the 2015 editions. Kohli’s pre-IPL statement that the T20 tournament will have no effect on the selections proved to be prophetic as Pant’s 245 runs in the IPL fell short of Karthik’s 111 runs. It is definitely a case which we have debated at length. In unison, we felt either DK or Pant will only come into the playing eleven if Mahi is injured. So, at that juncture if it is a crucial match, a quarterfinal or a semifinal, keeping also matters,” Prasad told reporters after the announcement of the squad. “That is the only reason why we went ahead with DK otherwise Pant was almost there,” he added. Another notable inclusion in the 15-man squad is Tamil Nadu’s seam bowling all-rounder Vijay Shankar, who is expected to be used as a floater in the batting order, especially at number 4. Shankar, with his “three-dimensional qualities”, took the slot which was speculated to go to Ambati Rayudu before his dip in form in the home series against Australia last month. We have been planning soon after the completion of the Champions Trophy (2017) for this. But let me tell you that in the last month or so, there have been a couple of players who have really cropped up like Vijay Shankar,” he said. There are no surprises with the pace department with Jasprit Bumrah expected to lead an attack that can include all-rounder Hardik Pandya, Bhuvneshwar Kumar and Mohammed Shami apart from wrist spin duo Kuldeep Yadav and Yuzvendra Chahal. The selectors can still make changes to the squad announced today. In the one-month window of April 23-May 23, teams can make changes to the squad without being required to provide any reasoning to the ICC. After May 23, through to the end of the tournament, any changes will have to be processed by the World Cup technical committee. The April 23 initial deadline allows ICC to get the logistics going in terms of tickets and room bookings. It also allows the teams playing warm-up matches till May 23 to cement their squads. However, India don’t have any international matches scheduled before the World Cup begins for them on June 6 against South Africa. The players will be busy with the Indian Premier League with the final scheduled on May 12.